There's a bit of a story behind this one. Before we left to go to Washington we had a fun day at the pool with the Jarbos. Brooke decided she was going to go down the slide and Lisa encouraged Camille to go to, I told her she didn't have to (if you see the yellow slide you'd understand). Not to mention she's not the most proficient swimmer yet, having just barely passed the polliwog level. Anyhow, Camille had no idea what she was doing, having never done it before so off she went. We looked up and realized she wasn't going down the blue slide, but the yellow. Even Lisa was surprised, maybe a bit concerned at this point. Off she went and when she got to the bottom she didn't pop right back up. I was about to jump in when I saw her head. We told her to use her hands and swim to the side. When she got there she said, "That was fast!" That was the last time she went down that slide. She did go down the blue slide though and because she went that made Connor want to try it. This is a huge feat for my children... and I didn't even have my camera! I snapped some pictures with my cell phone, but have not been able to figure out how to download them yet. The pool closed on the 15th of August (the day we got back from WA), but would have acouple weekends still open. 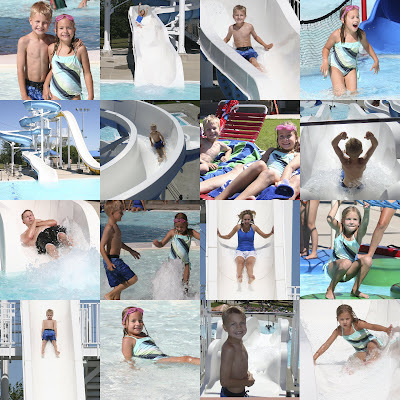 I was determined we would go down the slides again, only this time with camera in hand. We finally got a nice day Saturday (Aug 23rd) and I was excited, but when Camille went up to go down the slide she was told she was an inch too short! I couldn't believe my luck. So, Connor and Haldan went down and then I noticed there was a shift change. I went up again with Camille and asked if she could go down. Again she was not tall enough. I explained that she had already gone down before and that we just wanted one picture. I did a little begging and after some hesitation they finally agreed to let her go down the blue slide just one time! We finally got a picture to document this accomlishment! Just a side note, when going down the yellow slide make sure you have a one piece or hold your suit down. I flashed the entire pool upon exiting the slide; it really does go fast! These are great pictures. I can't believe camille went down that yellow slide. I wouldn't have even done that. Good job camille! !